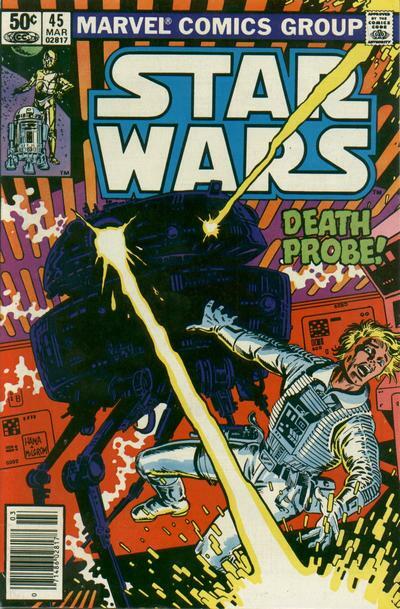 Luke is trapped aboard a Rebel ship with a murderous probe droid. A Rebel ship is attacked by a larger, more sophisticated Imperial probe droid. 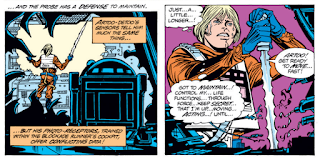 The droid quickly dispatches the crew and takes control of the ship, much to the pleasure of Admiral Krall, the mastermind behind the advanced droid. 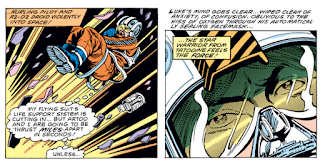 Meanwhile, Luke is on a routine patrol when he encounters the ship, which blasts his X-wing out from under him. Fortunately, Luke and Artoo are able to escape the wreckage and reach the commandeered ship. They fight way their through the ship as the droid uses its automated systems against them, eventually realizing the droid has taken full control of the ship and intends to explode its reactor once it reaches the rest of the Rebel fleet. 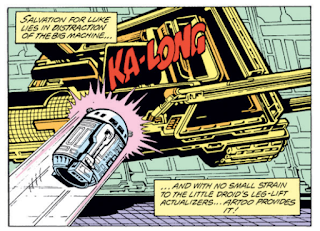 Using the Force to mask his movements, Luke is able to override the droid's control, then he and Artoo board an escape pod as the ship jumps to lightspeed. Moments later, it emerges from hyperspace and flies into Admiral Krall's Star Destroyer, just as the droid detonates the reactor, destroying both ships. 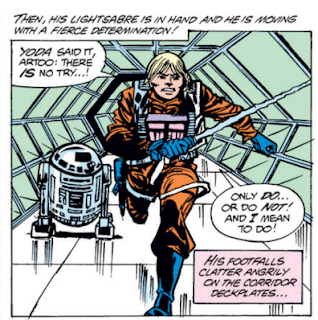 This is the series first post-Empire issue of the series, and right out of the gate, it presents a pretty big continuity gaffe: throughout this issue, Luke uses a blue-bladed lightsaber that is clearly drawn like the one he used earlier in the series, despite having lost it during his battle with Darth Vader in the previous issue. So apparently the answer to "how will the series deal with Luke having lost his signature weapon?" is "it will ignore that fact and just have him use it regardless." Carmine Infantino returns to the series after taking the Empire adaptation off, though he's only back on the book through issue #48. Louise Jones (later Simonson) takes over as editor of the series from writer/editor Archie Goodwin. Simonson, who is married to future Star Wars writer and artist Walt Simonson, is also editing Chris Claremont's X-Men at this time, and will eventually become a freelance writer herself, notably on Power Pack, X-Factor and New Mutants. Reportedly, Weezie requested that the ships and tech in the series more faithfully resemble their movie counterparts moving forward, thus curbing some of Infantino's more freestyle ship designs in his final issues. 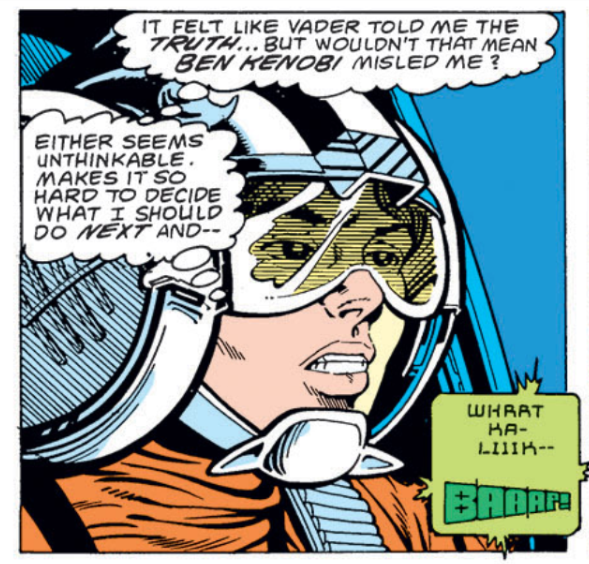 Luke ponders whether or not Vader is his father, and whether Obi-Wan lied to him about it. 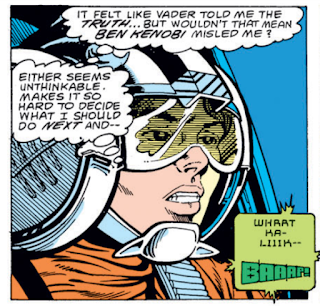 It's important to remember that until Return of the Jedi was released, there was plenty of speculation as to whether Vader was telling Luke the truth at the end of Empire. As detailed in the previous issue, Archie Goodwin is no longer the editor of the series at this point, but remains as the writer of this issue (and a couple more). Future GI Joe and Wolverine writer Larry Hama drew the cover to this issue. He'll return to write issue #48. The Rebel ship targeted by the Imperials this issue is attempting to rendezvous with the rest of the fleet following the evacuation of Hoth when it's attacked, and Luke is out on patrol in an attempt to test himself following the events of the film. Artoo uses his "leg lift actualizers" to spring into action, proof that Attack of the Clones wasn't the first time someone thought to increase Artoo's range of motion. 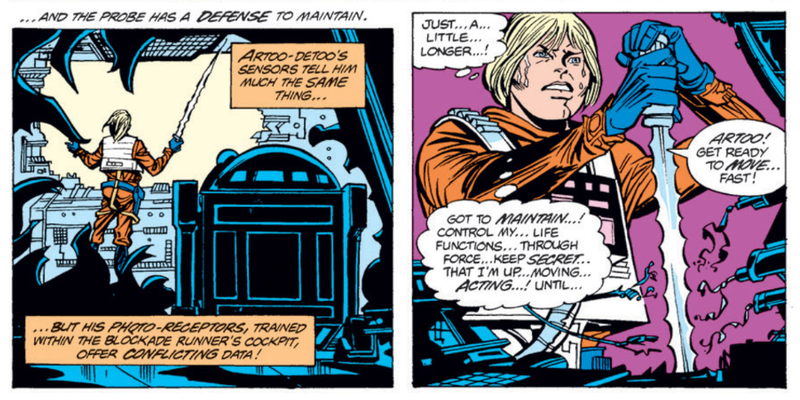 Luke is able to use the Force to control his life functions, enabling him to trick the probe droid into thinking he's unconscious and not moving. 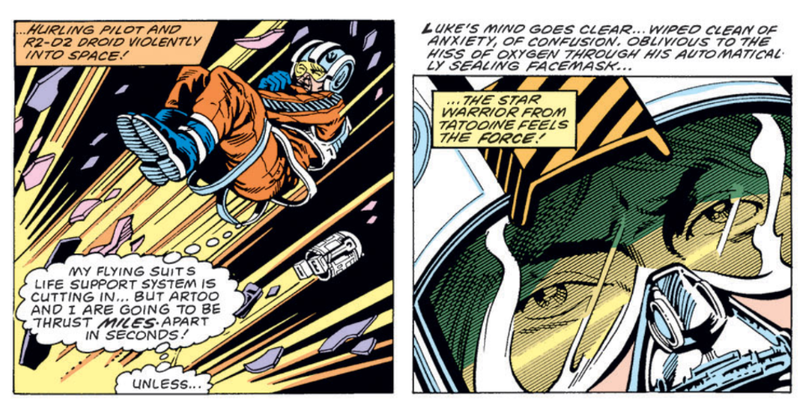 While dialogue establishes that Luke's flight suit is sealed to keep him alive in space, he clearly still as exposed skin between the mask of his helmet and his breathing apparatus. A response to a letter in this issue names the smaller Walker that looks like an ostrich a "Walker Scout", though we more commonly know it today as a Scout Walker or Chicken Walker, with the technical name of AT-ST or All-Terrain Scout Transport. This issue features a full page splash recounting Luke's training on Dagobah and confrontation with Darth Vader. 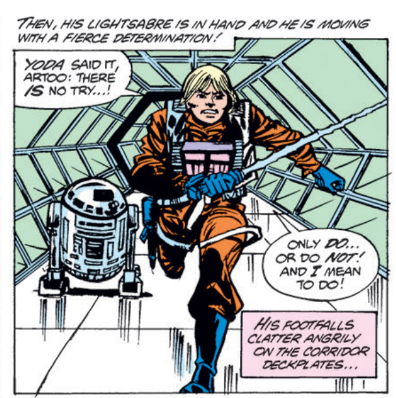 Later, Luke recalls Yoda's now-famous don't-bother-trying axiom. Luke is worried he and Artoo will be carried "miles" apart. A different response to a letter asking about the "extra" stories created for the Marvel UK book (since the book was weekly, it ended up needing more new content than the contemporaneous monthly US series) promises that the stories will see print someday, despite being set pre-Empire; anyone know if they ever actually did get reprinted in the US, and how? Of all the various new characters, places, vehicles and things introduced in The Empire Strikes Back, I'm not sure the Imperial Probe Droid would have been on the top of my list of such things to feature in the first post-Empire issue of the series, but that's what Goodwin went with. Taken on its own merits, this issue mostly works and is plenty enjoyable - it's pretty much Die Hard on a starship, with Luke fighting against a ticking clock to regain control of the ship - and it definitely feels of a piece with the work Goodwin & Infantino were doing in the series before Empire. But as the first post-Empire issue of the series, it's a bit of a letdown, reading like a water-treading exercise before a new direction is decided upon. Take out the probe droid and a few bits of dialogue referencing events of the film, and this could have taken place at any time in the series' history, with Luke's characterization more or less matching what it was pre-Empire (ie an often over-matched but dogged & determined hero). 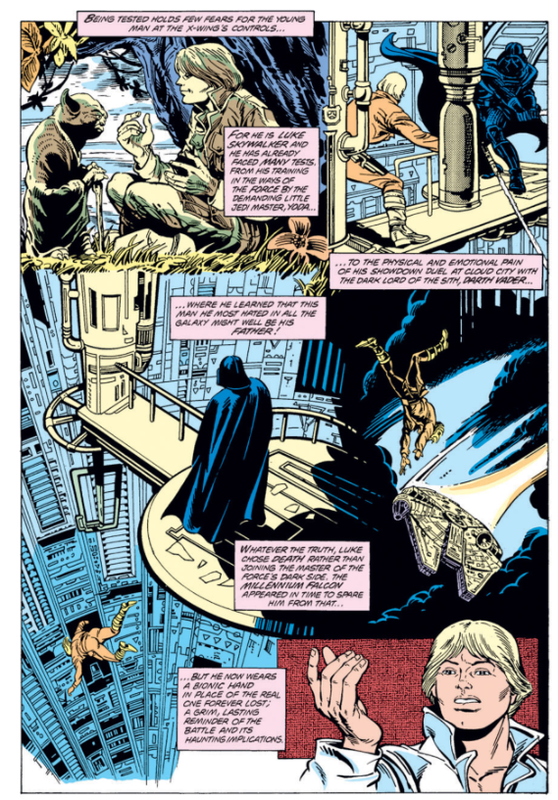 I don't know that Goodwin wrote (and Infantino drew) this before adapting Empire, but it definitely reads at times like he could have (with the Empire recap page added in after the fact). Whatever the case, as entertaining as this story is in a vacuum, as the latest chapter in the ongoing narrative of the series, it's a disappointing start to the post-Empire era, more of a breath-catcher than a deep dive into the saga's new status quo. The search for Han Solo begins. Wow, you're already past EMPIRE. How exactly the comic continued in this era interests me, if only because the ending of EMPIRE would seem to leave Goodwin in the position of treading water until the next movie. Hama's art, I've always thought, was underrated. Apparently, he did layouts for numerous Marvel covers in this era, but wasn't credited for them. From what I've gathered, there's definitely a lot of water treading going on in these post-EMPIRE issues, but also some of the series best/most well-remembered issues. So it should be an interesting mix! Well, I guess it is a fairly small-scale story to queue up in the wake of the Empire adaptation — stakes aside, because that ship exploding in the middle of the Rebel fleet would’ve been catastrophic — but I enjoyed it more than I expected to. Unfortunately Archie was much better with post-SW plotting than post-ESB, but Michelinie will show up soon and things REALLY take off! Still, good to see the Goodwin/Infantino team for a last lap before the next team comes aboard. Great post.